When I first started growing Charentais French breakfast melons from seed I was so hooked that I vowed I would never grow any other cantaloupe again. But a meager harvest last year, and late start due to a cold spring this year made me reconsider. So I bought four cantaloupe seedlings in May, a variety that came with a high recommendation from the nursery owner. Because I treated them rather as a backup, and not like the real thing, I did not even write down what I bought, which I now regret. I do not regret growing them. For the past ten days my family has been feasting on large, sweet cantaloupes. 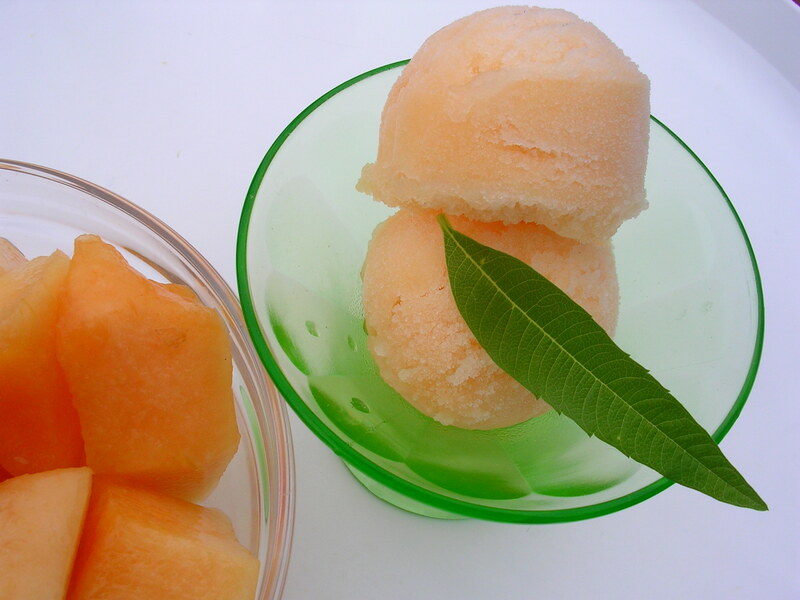 I also set some super-ripe ones aside to make a few batches of my Cantaloupe Sorbet, yet this time I used lemon verbena instead of lemon balm, which I think is a step up. The Charentais are just starting to ripen. By the time they are ready to harvest we will have had our fill so we will be quite happy with having a few breakfast-size melons to nibble on.